A petition calling for his arrest has garnered nearly 100,000 signatures. By Kyle Scott Clauss·	 3/4/2016, 10:07 a.m.
State officials do not believe former President Bill Clinton violated election law while visiting polling locations in West Roxbury and New Bedford on Super Tuesday. 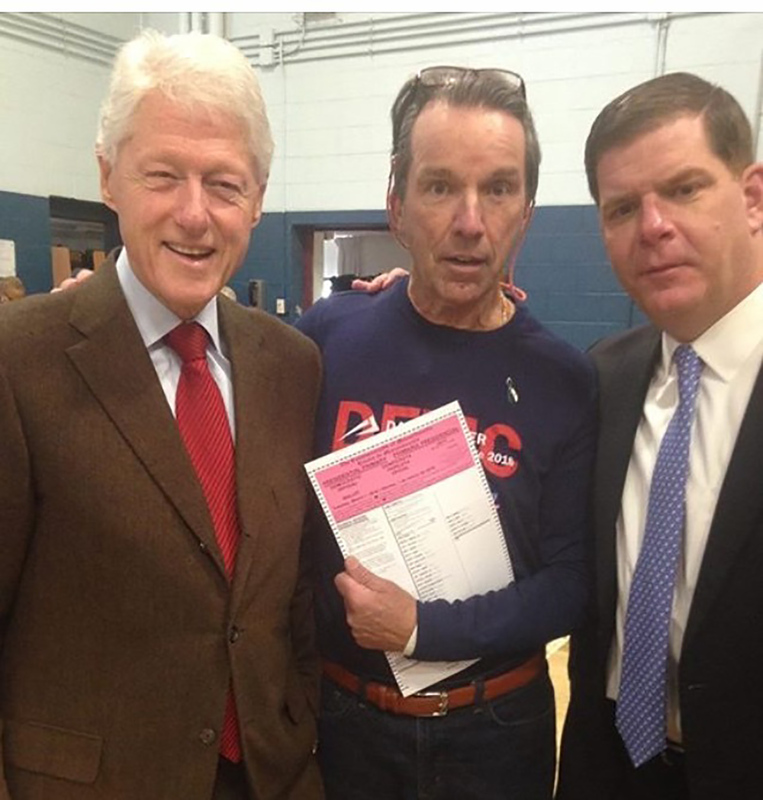 After greeting voters and poll workers, Clinton posed with Mayor Marty Walsh and a man holding a Democratic ballot inside the Holy Name gymnasium in West Roxbury in a photograph first obtained by Boston magazine. Clinton later appeared outside a polling location in New Bedford with Mayor Jon Mitchell and used a megaphone to stump for his wife, Democratic frontrunner Hillary Clinton. Massachusetts election law prohibits any person from distributing “campaign material intended to influence the vote of a voter in the ongoing election” within 150 of a polling location. In addition, “no person shall solicit votes for or against, or otherwise promote or oppose, any person or political party or position on a ballot question, to be voted on at the current election,” the law reads. McNiff told the New Bedford Standard-Times via email Thursday “there was no violation,” despite Clinton and Mitchell standing, by the paper’s estimate, 85 feet from the polling place. “The Secretary of State has already said it’s not looking into the matter any further. That office has made its decision,” Mitchell told the Standard-Times. Had Galvin’s office determined there was a violation, state law would only require Clinton to pay a $20 fine. An online petition started by a woman in Chicago calling for Clinton’s “immediate arrest” has garnered nearly 100,000 signatures, and the Standard-Times says it’s received about 60 form letters with regard to Tuesday’s incidents.